The Metropolitan Museum’s current exhibition, Jewels by JAR, has attracted extensive print and online notice because it showcases opulent pieces created by a living jeweler. On view are 400 necklaces, brooches, earrings and rings in sapphire, diamond, topaz, ruby, and garnet by the American-born, Parisian jewelry designer Joel A. Rosenthal (born 1943). Rosenthal is best-known for his boldface name clients and for his use of a pavé technique whereby stones are so closely set that they form a carpet of jewels. The Met’s director Thomas P. Campbell described Rosenthal’s work to The New York Times: “He’s almost like a sculptor in gems.” The idea of the sculptural presence in jewelry is legitimate. But the fact that a number of prominent mid-twentieth century sculptors created jewelry is fascinating in light of the attention to the JAR bling. They were foremost identified as sculptors. Whereas JAR leads with splendor, these artists lead with sculpture. Mid-twentieth century sculptors were steeped in modernist materials and methods; their process for creating jewelry mimicked that of their work. It is worth considering how sculptors from the Abstract Expressionist-era — Harry Bertoia (1915-1978), Alexander Calder (1898-1976) and Ibram Lassaw (1913-2003) — each created modernist jewelry distinctly channeling their studio work. (Calder’s jewelry was featured in a Metropolitan Museum exhibition in 2008.) Art Smith (1917-1982) trained as a sculptor before becoming a studio jeweler and Margaret De Patta (1903-1964)’s jewelry was inspired by Constructivist sculpture. The forms in their bracelets, rings and necklaces resembled the forms in their art: undulating imagery that reflected or amplified nature and the human body. It was a way for Surrealist-inspired forms and organic abstraction to physically link with the human body. The body was seamlessly linked to the ornament. Oftentimes the jewelry was so substantial that it would consume the wearer. To be sure, comparing the Met’s show which displays a designer working in traditional materials, forms and themes with the output of vanguard artists is a study in contrasts: period, geography, clientele, materials and market all diverge when comparing haute gems with innovative sculptural practice. JAR Zebra Brooch, 1987. Agate, diamonds, a sapphire, silver, and gold. Private collection Photograph by Katharina Faerber. Courtesy of JAR, Paris. JAR works in a tradition that celebrates marrying the realism of flowers and butterflies, for example, with spectacular stones. And while some say that Rosenthal’s pieces straddle the line between jewelry and sculpture (certainly the scale of some of the objects would present a challenge for the wearer), he is foremost considered a designer, not a sculptor. His glittery materials oppose the brass, silver and gold which twentieth- and twenty-first century sculptors used to create jewelry. Their goal was to communicate and enhance the elegance of the neck, the reach of the finger, or the extension of the wrist through an economy of materials. 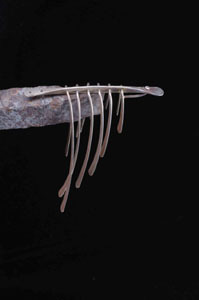 What are readers’ thoughts about modern and contemporary jewelry design in the realm of sculpture? Why do contemporary sculptors create jewelry? Are they compelled by the opportunity to physically incorporate the human form into their work? Jewels by JAR is on view at The Metropolitan Museum of Art through March 9, 2014. Featured image: JAR Multicolored Handkerchief Earrings, 2011. Sapphires, demantoid and other garnets, zircons, tourmalines, emeralds, rubies, fire opals, spinels, beryls, diamonds, platinum, silver, and gold. Private collection Photograph by Jozsef Tari. Courtesy of JAR, Paris.